Saunjune's Craftopia: Starting a new painting project! Starting a new painting project! I worked on this a couple of saturdays ago at the national scrapbook day crop. I have been toying w/ the drawing since last September, and finally decided to get it out again. 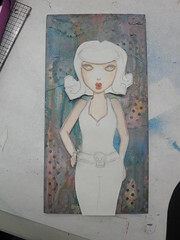 I am pleased with the way the background turned out....We'll see how the painting goes! I love the silhouette of this gal! I can not wait to see your end product. Thanks so much for sharing the process with us here on your blog.